My best friend tells me I should be some kind of Lidl ambassador, such is my ability to impress her with meals made from ingredients bought there. 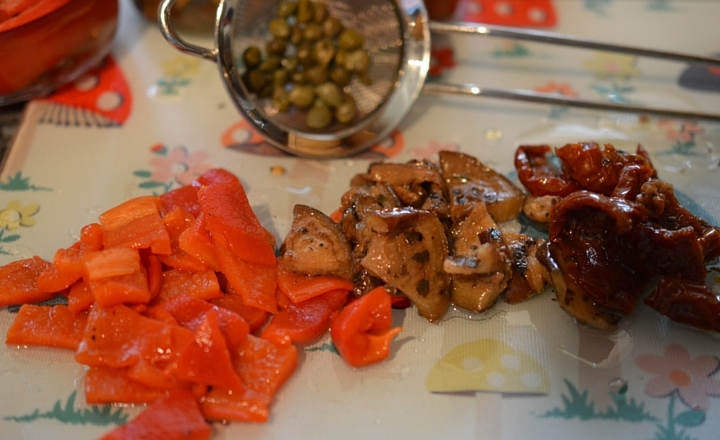 I am really loving the jars of antipasti which they have there at the moment: roasted peppers, grilled aubergine, sun dried tomatoes and capers. They are all far cheaper than buying in one of the big four supermarkets and equally as tasty. I am finding it really handy to have these jars in the fridge most weeks as they are so versatile: pizza topping, salad, pasta salad for lunches and this pie. 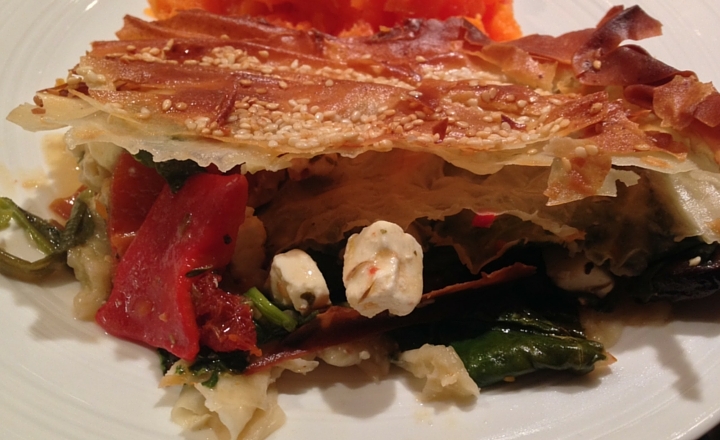 This antipasti pie is a pimped out version of feta and spinach pie which I love. They add tonnes of flavour and some much needed bulk, as well as a little bit of Med-inspired sunshine on your dinner table. 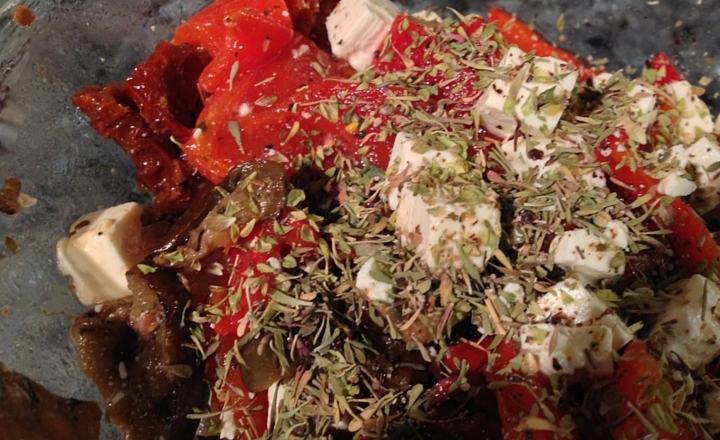 Sheer laziness led me to buy the feta cheese which is already cut into tiny cubes, but I have found that a) it is ok tasting and b) really helps my cheese portion control when I am having it in salads for lunch. Where as a 200g block would go in no time, 200g of tiny cubes seem to go further. 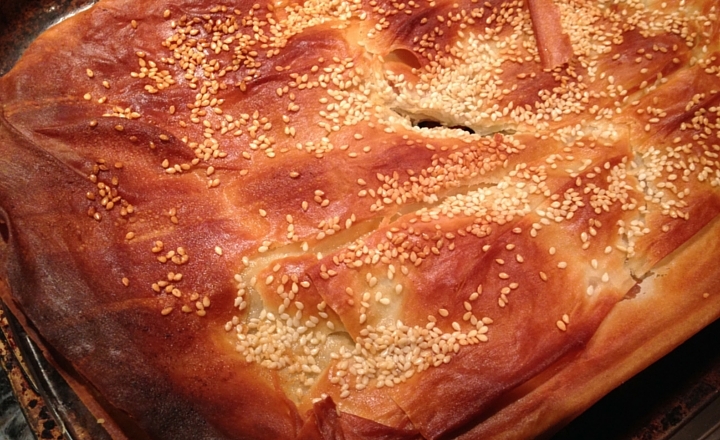 An easy to prepare pie made with filo/phylo pastry, jars of antipasti and feta cheese. take the pastry out of the fridge approx. 30 mins before you are ready to use it. Gently melt the butter in a pan over a low heat. 2. Chop the veggies and cheese into bite sized chunks and mix in a bowl with the seasoning. 3. 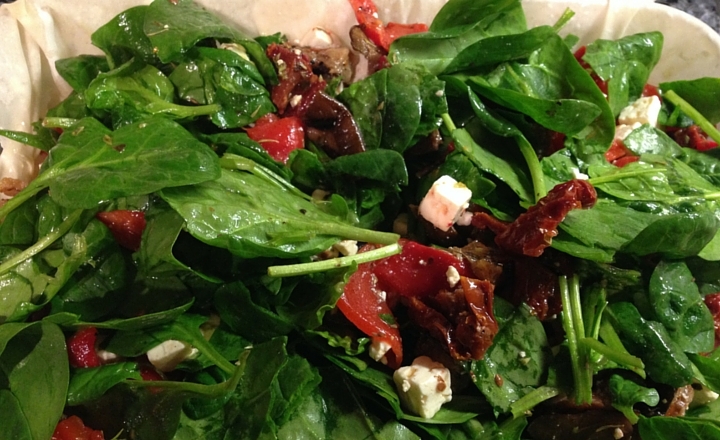 Tear the spinach leaves and place in a colander. Pour over boiled water to wilt slightly. Then squeeze using a tea towel to get out as much excess water as possible. Add to the cheese and veg and mix well. 4. Grease a 20cm square deep dish and gently place three sheets of filo pastry in the bottom overlapping- buttering each layer with the melted butter as you go. Leave the ends hanging over. Add the filling and gently fold the pastry overhangs over the pie. Again, butter the top. Add two or three more layers of pastry, buttering the top of each. On your final layer, butter and sprinkle generously with sesame seeds. 5. Cook in the oven for 20-25 mins until golden. You can use the pie filling ingredients to top a thin and crispy home made pizza (maybe use pesto for the base sauce) or in a pasta salad for lunch boxes. Top tip from my friend is to add a small amount of rice to the mix. This will cook in the oven, soaking up all of the cooking liquid and avoiding soggy bottom! It is British Pie Week this week, so I hope this inspires some pie-based goodness in your kitchen!